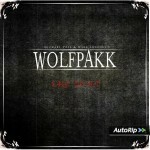 Share the post "Album review: WOLFPAKK – Cry Wolf"
The music is generally what I would class as Melodic Metal…but that is a rather large umbrella to be classed under! The songs are split between the more atmospheric Helloween/Avantasia type numbers and then the more straight forward Scorpions/Saxon rockers. We also have an alternative split of subject if you like with about fifty percent of the songs being “wolf” related. Moonlight kicks things off in superb fashion with a wolf tale back by typical Teutonic metal. A Matter of Time keeps things ticking with its Judas Priest riffing (is that a Turbo influence I can hear…). The only real change of pace on the album is the big ballad Cold Winter featuring the amazing Amanda “symphonic metal vocal coach extraordinaire” Somerville. Vocal duty is split between Amanda, Michael Voss and Mark Sweeney – check out the wolf related video on YouTube. Speaking of videos, Wolfpakk have also released a video for the rockier Dark Revelation…moral of the story don’t leave your black magic practising girlfriend at home whilst you go down the local bar for a few pints with your mate…you will regret it! Wakken is another straight forward rocker, presumably written in tribute to the Wacken Open Air Festival held in Germany each year, hitting the spot with its “Metal Attack!” vocal refrain. Lone cover version is Rainbow’s classic Run with the Wolf and obviously features guest Tony Carey on keyboards. Epic closer Cry Wolf cannot be faulted from its acoustic, piano, rain and Native American introduction through to the epic conclusion. If you’re a fan of German melodic metal then this is highly recommended…if not then open your ears and give it a try. AFM seem to be releasing some high quality product of late…keep it up. This entry was posted in ALBUM REVIEWS, ALBUM REVIEWS (Mobile), All Posts and tagged album, Amanda Somerville, Blaze Bayley, Cry Wolf, Crystal Ball, Don Airey, Hermann Rarebell, Johnny Gioeli, Kee Marcello, Mad Max, melodic metal, Michael Voss, Paul Sweeney, Ralf Scheepers, review, rock, Roland Grapow, Tony Carey, Wolfpakk. Bookmark the permalink.